WW1 period Royal Naval Air Service issue flying goggles. These are manufactured with a soft leather facemask, brushed cotton backing and fur edge trim. The lenses, technically known as 'filters', are mounted in hinged metal frames set within the facemask and a simple elastcated strap and clasp complete the goggle. They were worn to assist visibility when searching for enemy shipping, submarines and mines at sea when viewed from the air. The instruction booklet explains how different coloured tinted laminated glass filters could be used for various tasks and conditions. These include observation through atmospheric haze, looking for water movement and surface disturbances caused by shipping, oil on the sea or even shadows beneath the surface. Over land they could help with the spotting of gun flashes, gun pits and dug-outs and some filters were also useful when flying at night. These goggles were found in Malta close to the location of the WW1 No.6 wing R.N.A.S seaplane base so it would seem likely that they originated there. They are in excellent probably unissued condition. The leather, frames and fur are superb and the strap looks good although it now lacks elasticity. Light soiling to the rear padding. 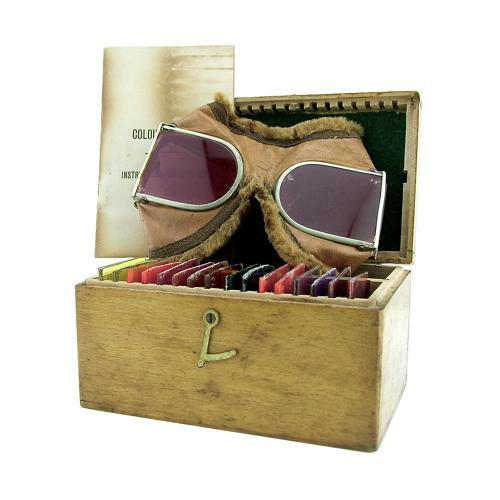 The goggles come with filters in place and in the original fitted wooden storage case complete with a full set of 16 numbered spare coloured filters and 6 page instruction booklet. The latter has a 1917 print date, some staining, rusted staples and loose pages. The box and spare filters all appear to be in very good condition. We sold a pair of these in 2002 and until now, that was the only pair we'd ever seen. Fabulous condition, extremely rare and at over 100 years old, a genuine antique! Stock code G23465.